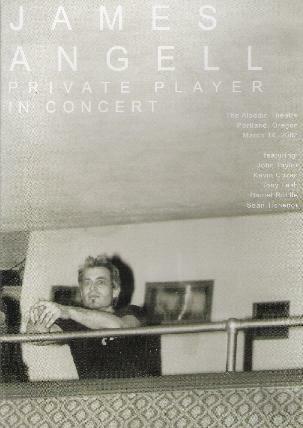 James Angell - "Private Player in Concert"
As someone who is immersed in space rock, psychedelia and progressive rock, but also loves a well written song, this DVD document of a 2003 performance by Portland, Oregon based singer-songwriter-pianist James Angell struck me as quite an extraordinary concert. My interest in the DVD was due to the involvement of King Black Acid leader and guitarist Daniel Riddle, who plays as part of Angell's band, though in the end Angell won me over with his blend of song craftsmanship and execution of those songs by the team of Angell on piano and vocals, Daniel Riddle on guitar, Sean Tichenor on guitar (also from King Black Acid), Kevin Cozad on keyboards, Tony Lash on drums and John Taylor on bass (ex-Duran Duran). How to describe James Angell's music? Well... at the core of the music is Angell, his piano and his songs, which struck me as a cross between John Lennon and Billy Joel. Angell plays beautifully and is a passionate and compelling singer. And the songs take more thematic twists and turns than you'll hear from the average singer songwriter. From one song to the next I really felt like I was being taken somewhere, or being told a story. In fact, in an interview segment included on the DVD, we learn that it was after hearing the Private Player studio album that Taylor attended an Angell solo performance in New York, and was sufficiently impressed by what he heard that he suggested that the two work together. But once the full band is added in we get something really quite magical. I haven't heard the Private Player studio album so I don't know how that compares to this performance, but Angell's songs take on a psychedelic, atmospheric and sometimes prog rock quality... though it's not what would typically be described as psychedelia or progressive rock. It's tough to describe and that's the beauty of it, and certainly what helps set Angell outside the box that most singer-songwriters, however talented they may be, are usually found in. The concert opens with "Hiding In Plain Sight", which immediately brought to mind the Lennon/Joel comparisons. Moving on to "Who's Wakin' Me Up? ", we're more in Billy Joel territory, though Angell is more on the jazzy side and Riddle starts to raise the atmospheric bar with bits of spacey guitar coloring. But then we get songs like "Ooh Love" and "Treat Song" that bring in keyboards with a more classic prog rock sound. And it's NOT the heavy bombastic stuff. "Treat Song" is indeed a treat, as it includes soaring space guitar from Riddle that becomes screaming during the intense moments. And then there's "Call Off The War", easily my favorite song of the set and the one that best exemplifies Angell's compositional sophistication. We've got more of the proggy atmospheric keyboards and trippy ethereal guitar, and in the course of the song Riddle launches into space with guitar work that recalls the early days of King Black Acid, though none of this ever overshadows the song. It's exciting to hear piano based singer-songwriter music that is so accessible to all, while so clearly being full of adventure and a willingness to be different. Throughout the show I found the music alternatively swooning, mind expanding, and just a hell of pleasure to listen to. And there were even moments that Riddle best describes during the interview segment as "crushing" and "impacting". For more information you can visit the Mandible Productions web site at: http://www.mandibleproductions.com. Visit the James Angell web site at: http://www.jamesangell.net.